Stephen Bellissimo is having quite the week. 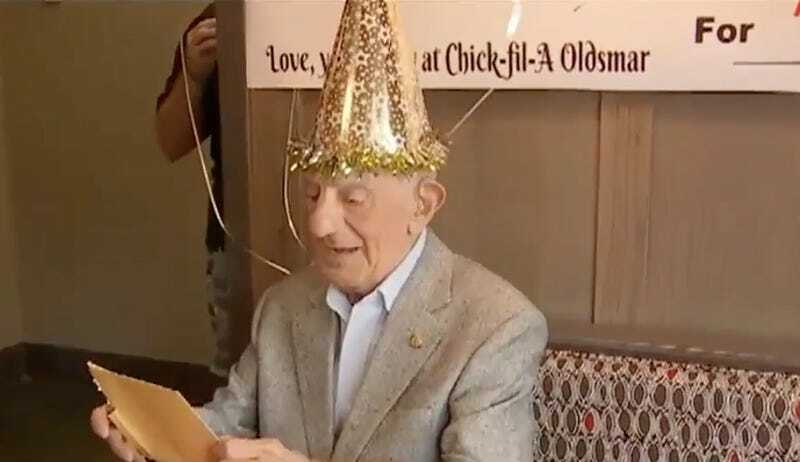 Not only did the Florida resident celebrate turning 100 years old while wearing a jaunty, shiny hat, but he was gifted free Chick-fil-A food for life. Bellissimo—known as “Mr. Steve” to the workers at his local Tampa-area Chick-fil-A—has been visiting that location every week for the past two decades, according to WSVN News. On his birthday, the restaurant surprised him with a party that included an offer of free food for life. “That is the best gift I could ever receive,” Bellisimo says in a Fox News Insider video. Apparently, Bellissimo had already been enjoying a 50-percent discount at the Oldsmar, Florida location, but he says the newly free food will probably inspire him to eat there every day for the rest of his life.